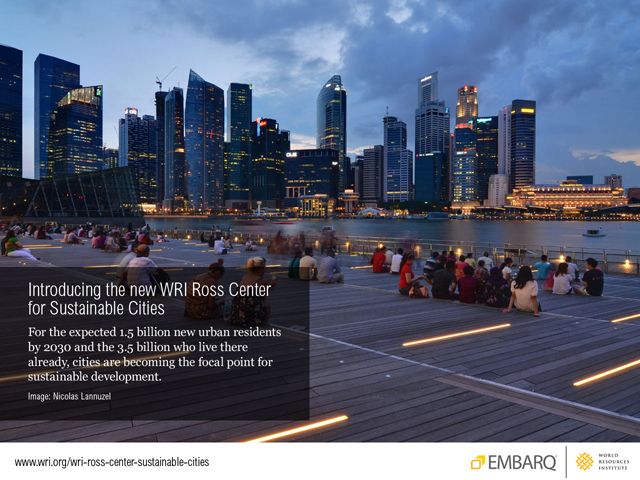 TheCityFix, produced by EMBARQ, is excited to announce the launch of the WRI Ross Center for Sustainable Cities, which will focus on research, tools, and on-the-ground action to develop accessible, healthy, equitable, and environmentally friendly cities. The Center will build on the work of EMBARQ, the sustainable transport and urban development program of WRI and the urban mobility pillar of the Center. This Center was created with the generous support of Stephen Ross, a world-recognized business leader, real-estate developer, and philanthropist, as well as a member of WRI’s Board, who contributed $30.5 million to galvanize action that will help cities grow smarter and more sustainably in developing countries around the world. Already, half the global population resides in cities. That figure is set to increase to 70% by 2050. The majority of this growth will occur in the developing world, and developing cities will bear roughly 80% of the costs associated with climate change adaptation. WRI understands that well designed cities can generate jobs, innovation, and economic growth for all. But when designed poorly – sprawling, wasteful, and car-centric – they can exacerbate pollution, inequality, and political instability. In order to shift current trends and ensure high quality of life for citizens around the globe over the course of the next century, the Center will galvanize action that will help cities grow more sustainably and improve quality of life in developing countries around the world. 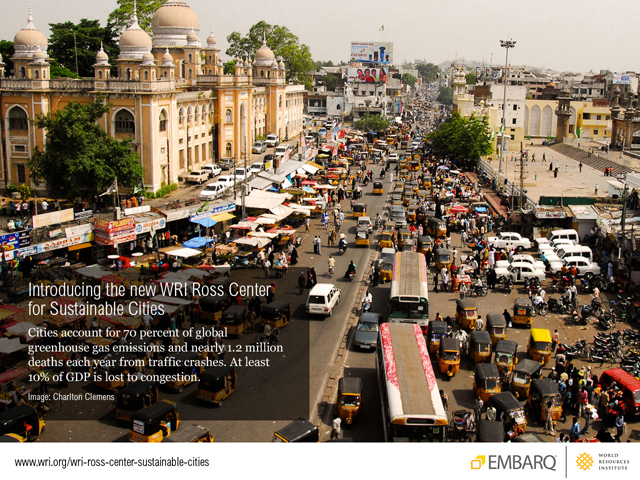 The Center will increase WRI’s reach in developed and emerging cities, building on the work of the EMBARQ Network. Cities account for 70% of global GHG emissions and nearly 1.2 million deaths each year due to traffic crashes. Nearly 10% of GDP is lost to congestion. Photo by Charlton Clemens. WRI has already made great strides in reversing car-centric modes of urban development through its research and on-the-ground action across the EMBARQ Network. EMBARQ Brazil created a manual to catalyze cycling in Rio de Janeiro’s favelas, as well as providing vital technical assistance and planning expertise to help Rio expand its bus rapid transit (BRT) lines. In India, EMBARQ has helped Bangalore create its BIG bus network which creates greater connectivity for the city and increases access for Bangalore’s residents, as well as coordinating CONNECTKaro, an annual conference which convenes leaders in the field of sustainable transport to push forward the creation of safe, affordable, equitable transport in India’s cities. Meanwhile in Mexico City, EMBARQ Mexico has worked both at the policy level, developing urban reform proposals to integrate sustainable transport into the development of Mexico’s cities, as well as helping on the ground to shape the city’s Metrobús BRT network. The entire EMBARQ Network – spanning Brazil, China, India, Mexico, and Turkey – works together to achieve on-the-ground impact and scale for global results. 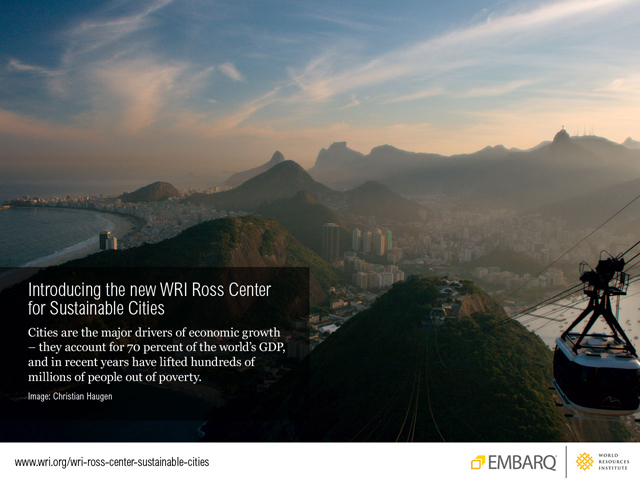 With the launch of the WRI Ross Center for Sustainable Cities, WRI looks to leverage EMBARQ’s success and complement existing expertise in sustainable urban mobility with expanding work in energy, water, and governance. This integrated approach focused on the broader urban environment can unlock immense potential for a sustainable urban future and improve quality of life in cities. For the expected 1.5 billion new residents by 2030 and the 3.5 billion who live there already, cities are becoming the focal point for sustainable development.